(CNN) -- Nico Rosberg in his Williams once again dominated Friday practice by topping the timesheets again at the Circuit de Catalunya. 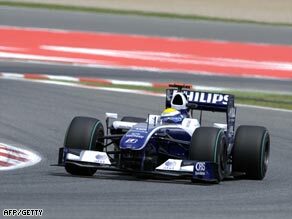 Rosberg powers to the fastest time in second practice at the Circuit de Catalunya. The German has been quickest in no less than eight of the 14 sessions this season, but has failed to translate that performance into Saturday qualifying. He has just 3.5 points after flattering to deceive come race day, but Williams will also take heart for the Spanish round with the performance of his teammate Kazuki Nakajima who set the second best time with a strong afternoon performance . Rosberg had a late scare with an electrical problem but then recorded a time of one minute 21.588 seconds with Nakajima just 0.152 seconds adrift. Championship leader Jenson Button in the Brawn GP was quickest in morning practice with the third best time overall, but with teams experimenting with their set-ups and fuel loads it was difficult to draw any conclusion from the times. Spanish hero Fernando Alonso in his Renault gave his home fans some cheer with the third best time of the afternoon, followed by Rubens Barrichello in the second Brawn GP and Red Bull Racing's Mark Webber. Button was sixth fastest in the afternoon, narrowly ahead of one of his main title rivals in Red Bull's Sebastian Vettel. But there was little cheer for last season's established order, with Kimi Raikkonen best for Ferrari but back in 10th and 11th in the two sessions. Reigning world champion Lewis Hamilton also struggled in his McLaren, 13th in the afternoon just ahead of teammate Heikki Kovalainen. Hamilton had predicted McLaren might be off the pace in Barcelona after a more promising performance in Bahrain. After finishing second, third and fourth in first practice, Jarno Trulli of Toyota and the BMW Saubers of Robert Kubica and Nick Heidfeld, were 19th, 16th and 17th in the afternoon, but Saturday's qualifying will establish the true order. Three victories in the opening four rounds have lifted Button 12 points clear in the title race of teammate Barrichello, taking advantage of the radical rear diffusers on their Ross Brawn-designed car.